on December 16th was a wonderful success! 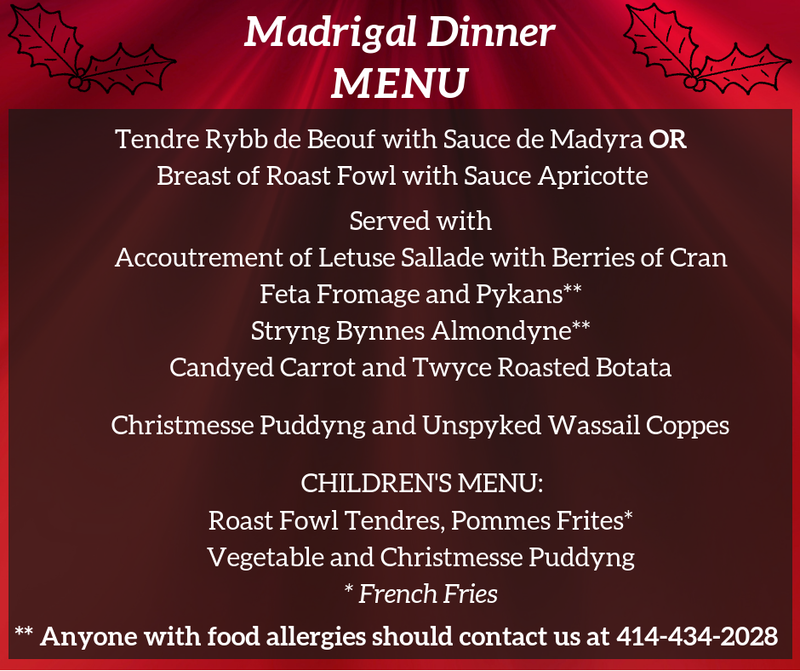 We had a wonderful Madrigal Dinner and Yuletide concert December 16th! Biggest and dearest THANK YOU to all of our volunteers, supporters, patrons, friends and sponsors for helping us make The Beach Boys concert a wonderful success! Please enjoy the video below with some of the highlights from the concert. Thank you to all who shared the merriment with us at our first Madrigal Dinner and Yuletide Concert! It was a great success and we hope to see you next year! Reserve your tickets through our online box office, www.swssymphony.org. You may also call 414-434-2028. Group Rates for 10+ Available by calling. 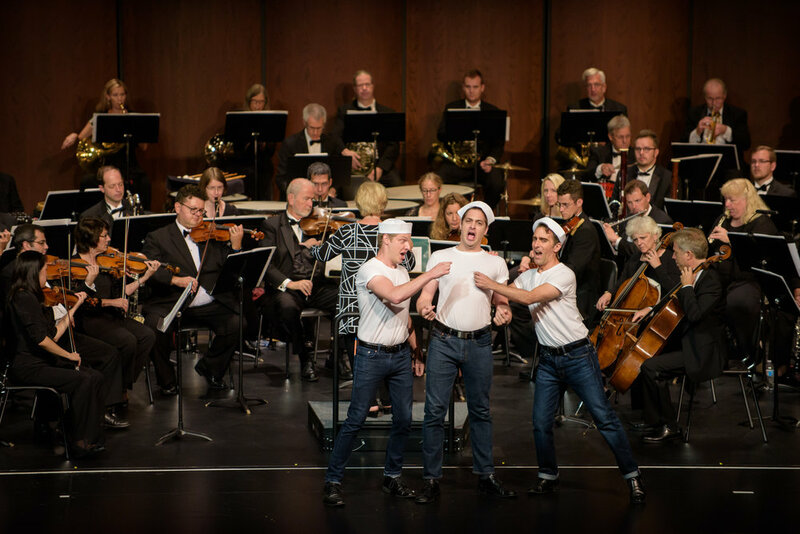 "A Bernstein Banquet" was a BIG success! "Reviews are in!" 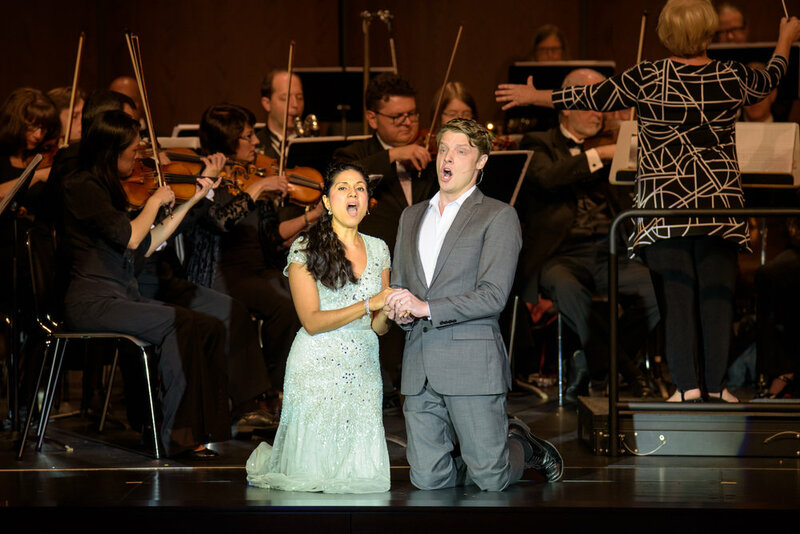 - The Shepherd Express describes "A Bernstein Banquet" as "a terrific show that paid rapturous homage to West Side Story with duets sung by Vanessa Rodriguez and Benjamin Robinson. The Bernstein of Broadway and Hollywood showed forth in splendor, "Simple Song" from Mass was gorgeously sung by Samual Piatt, "Glitter and Be Gay" was sung and acted to zany perfection by Alisa Suzanne Jordheim, and the whole cast brought the concert to a rousing conclusion with a spectacular "Conga" from Wonderful Town"! The Southwestern Suburban Symphony welcomed 500+ school children to "Hallelujah Handel" January 13, 2017. Christine Flasch grew up the sixth of an artistically inclined family of eight in Milwaukee, Wisconsin. Beginning with dance lessons at 5, piano at 6, voice at 12, and organ at 13, she had logged many hours of training by the time she reached high school. Already inclined toward teaching and accompanying, she taught a number of piano and voice students, and continued in the same capacity in college and throughout her years in graduate school as a teaching fellow in voice at Syracuse University. Flasch received a master’s degree in vocal performance on a full scholarship. After singing leading roles throughout the country under management for twelve years, and in order to be home with her young son, Justin, Flasch joined the Metropolitan Opera Chorus where she sang several comprimario roles, and worked with the leading singers, conductors, and stage directors in the world. Desiring to stretch her wings, Flasch returned to the Milwaukee area and quickly joined the rosters of several colleges and universities in Wisconsin and Illinois, including the prestigious Chicago College of Performing Arts/Roosevelt University where she was a member of the voice faculty. She was recruited to build Music by the Lake, a summer music festival under the auspices of Aurora University in Illinois in 2000, and developed the festival into a highly successful program of eight concerts each season. In 2014 the festival welcomed more than 10,000 patrons to the summer performances at George Williams College’s Ferro Pavilion on Geneva Lake. As part of the summer line up, Flasch honed her skills as a conductor by producing and directingthirteen years of opera, operetta and musical theatre productions. Shewelcomed leading artists from across the United States, as well as emerging young artists from Chicago, Milwaukee and Madison. Her productions drew enthusiastic audiences from throughout the Midwest and helped launch the careers of hundreds of talented young singers. Her annual Christmas concerts to “sold out” crowds drew the finest instrumentalists and singers to the campus for ten seasons. Flasch left her position as Executive Director at MBTL to dedicate her energies toward building top notch musical programs in her own community of Franklin. She will lead the Tri-state area’s finest instrumentalists and vocalists in a broad variety of musical concerts as she seeks to build the emerging Southwestern suburbs into a new – and unexpected – arts destination. Flasch's instrumental conducting credits include operatic and concert performances with The Florentine Opera’s performances for the young with the Waukesha Symphony (The Magic Flute), Carroll University Cosi fan tutte, The Priates of Penzance, Die Fledermaus, and thirteen years as conductor of the Music by the Lake summer operas and annual Christmas concerts. Major works included La Boheme, The New Moon, Madama Butterfly, La Traviata, Music in the Air, Brigadoon, and Gala of Stars, a medley of fortyselections from opera and musical theatre. She has nurtured the careers of hundreds of gifted young singers, many of whom are currently enjoying successful careers nationwide. IN THE SOUTHWESTERN SUBURBS - MILWAUKEE'S EMERGING TOP "NEIGHBORHOOD"
Thank you for joining us for "Simply Sinatra"
"SIMPLY SINATRA" WAS "SIMPLY SPECTACULAR"! Thanks to Steve Lippia, Steve Sigmund, The Southwestern Suburban Symphony Big Band, SWSS staff and volunteers! Amahl and the Night Visitors was a marvelous success! The Southwestern Suburban Symphony has arrived, prepared to deliver high caliber musical concerts for the people in Franklin, Greendale, Hales Corners, Muskego, New Berlin, Greenfield, West Allis and beyond. The fully professional orchestra of the area’s finest instrumentalists led by Executive Director Christine Flasch is committed to presenting a broad variety of superb vocal and instrumental performances in the area’s leading venues. We will serve these communities with engaging concerts for the general public, children and families, and an ever growing population of vital seniors who make the suburbs their home. 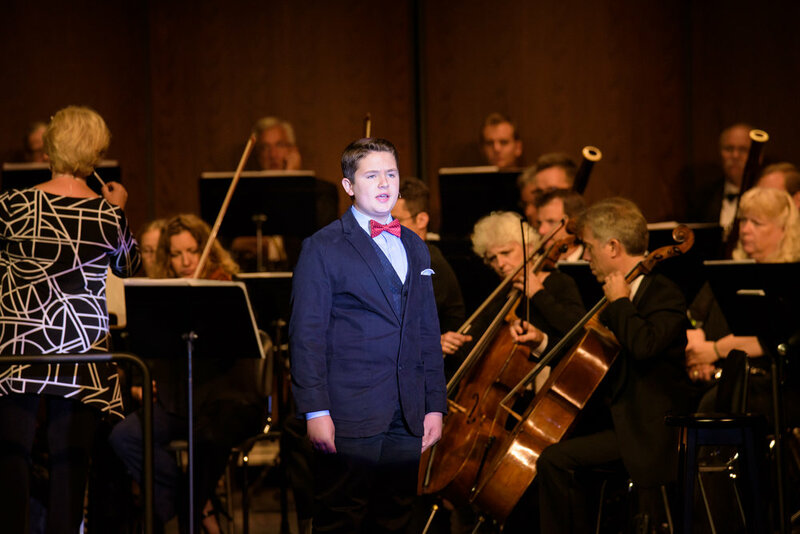 "Glorious Gershwin", the orchestra's debut in August 2016 at the Saber Center for the Performing Arts in Franklin resulted in a full house of enthusiastic local patrons. The Shepherd Express described the concert in glowing terms: "Flasch led a well-rehearsed, tight, crisp-sounding group in a fine primer on George Gershwin. The works selected (were) performed with exuberance and flair...the colors blazed brightly". We invite you to get on board with the burgeoning segment of Milwaukee suburbanites who love live music. Join us in your own “back yard” for great music that speaks to your heart and soul. Music makes it happen and we want you to be a part of it! The Southwestern Suburban Symphony always needs great folks to fill various roles at our events. Volunteer positions include Ushers, Box Office Staff, Greeters, Parking Lot Attendants, Backstage help, including artist relations, and catering needs in the rehearsal areas. If you are a "people person", have good organizational skills, and enjoy working in the theater this will be a very satisfying way to use your talents to help us grow. And you will hear some marvelous music in the mean time! For more information, please fill out the contact form below. We would love to have you join our great team! The Southwestern Suburban Symphony has arrived in the Milwaukee suburbs prepared to deliver high caliber musical concerts for the people in Franklin, Muskego, Greendale, Hales Corners, New Berlin, Greenfield, West Allis and beyond. The fully professional orchestra of the area’s finest instrumentalists led by Executive Director Christine Flasch is committed to presenting a broad variety of suberb performances in the southwestern suburbs. We will serve these communities with concerts for the general public, children and families, Baby Boomers and an ever-growing population of vital seniors who make the southwestern suburbs their home. The music makes it happen…and we want you to be a part of it. Let’s shake up Milwaukee by bringing Packers Fans, Cheeseheads, Harley riders, Brewers backers (baseball and beer), and all our kids back into the theater for live music right here in the suburbs at an affordable price. Sophistication never sounded so good, so join us and help us put the southwestern suburbs on the cultural map of Milwaukee…our time has come! Get on board with the burgeoning segment of Milwaukeans who love live music…join us in your own backyard for great music that speaks to your heart and soul! 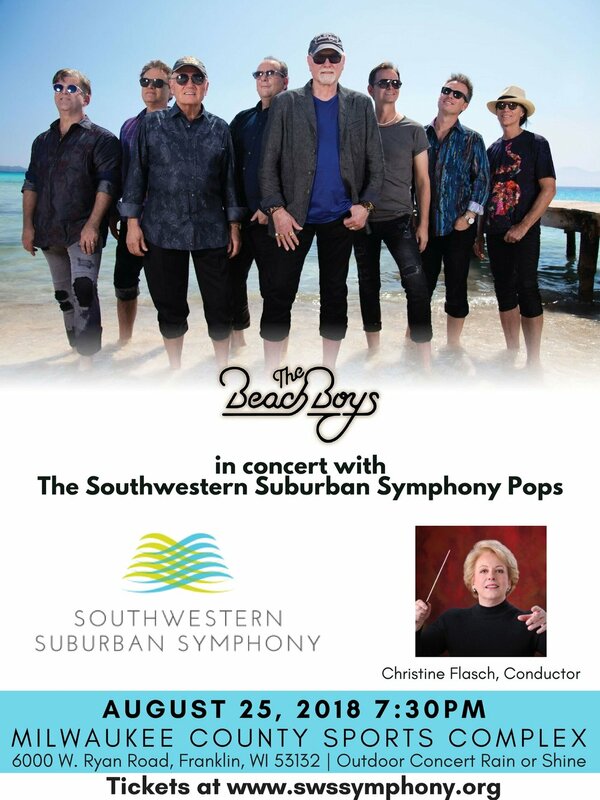 The Southwestern Suburban Symphony – the Peoples Orchestra – does it all for YOU! "Success, like happiness, cannot be pursued, it must ensue, and it only does so as the unintended side effect of one’s dedication to a cause greater than oneself."